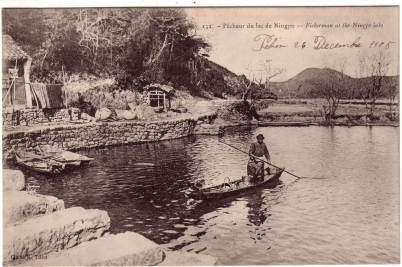 Action: On a lake in hilly country, a man in winter clothing pushes with his pole a small sampan carrying baskets. Two more boats are tied to a stone-faced embankment. Bedding is being aired in front of a house, near large containers for water or fish and a shed. More boats appear to the right under trees. In the center, the path goes up with stone steps similar to those in the forefront.